The beauty of white contemporary-style kitchen that we’ll show you is in its clean look, sleek lines, geometric form, ergonomic layout, and function. If you’re looking for a neutral kitchen look, this might inspire you. 💙 Check it out! No worries, we’ll explain the best features of this design along the way. Most homeowners only know about the one-wall, galley, l-shaped, horseshoe, and g-shaped kitchen layouts. This is a new category and it’s called a peninsula. It features a connected island, which either converts a regular layout into another. In this case, an l-shaped kitchen became u-shaped. The peninsula kitchen layout works best in open-plan spaces. Its architecture perfectly separates the kitchen from the living space. And because the island is attached to the bench, you gain more workspace. 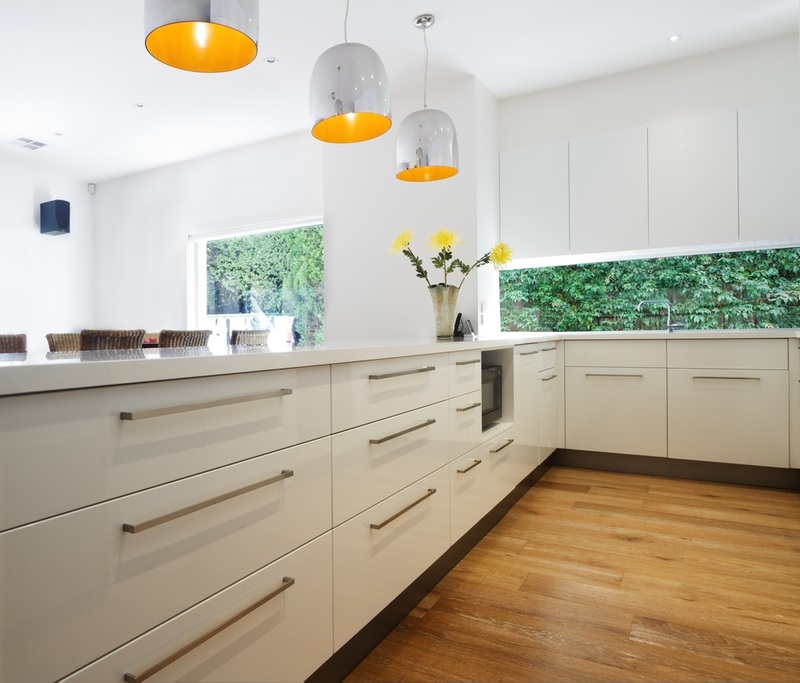 To avoid a stark look, the designers injected wooden elements this white contemporary kitchen design. They laid wooden vinyl tiles on the floor. It warmed the space up. 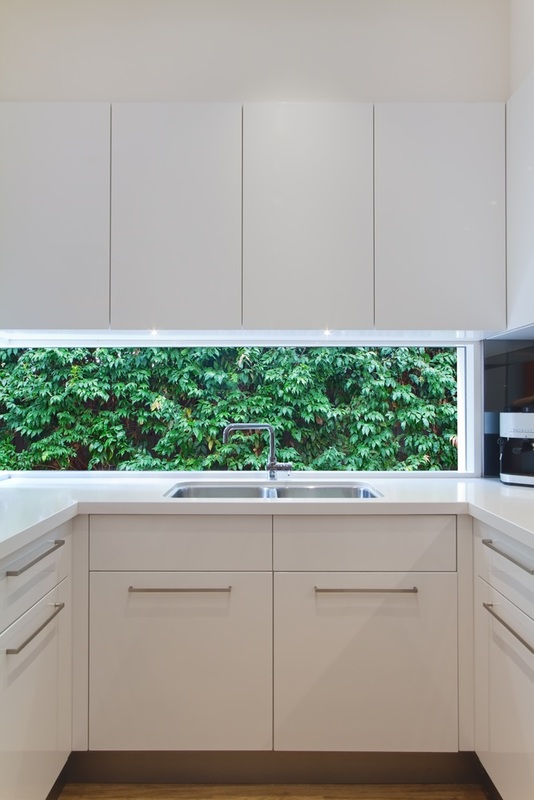 Knowing there’s a green hedge outside, the designers confidently created a window splashback. It gave the kitchen a fresh touch. No more indoor plants needed! (The homeowners may display one if they wish to). Contemporary kitchens also celebrate linear congruence. In this kitchen, you see streamlined rows of drawers, cabinets, and cupboards. Even the vinyl planks are laid horizontally. The bar-shaped cabinet pulls are sleek that the cabinets remain plain. Always avoid ornate cabinet pulls in contemporary kitchens. Go for a plain and straightforward design instead. You may use any finish you want, but most people prefer steel, chrome, or nickel. Full overlay cabinets with simple cabinet pulls are a staple in contemporary kitchens. This one houses a small pantry. The solid doors covered all the clutter. 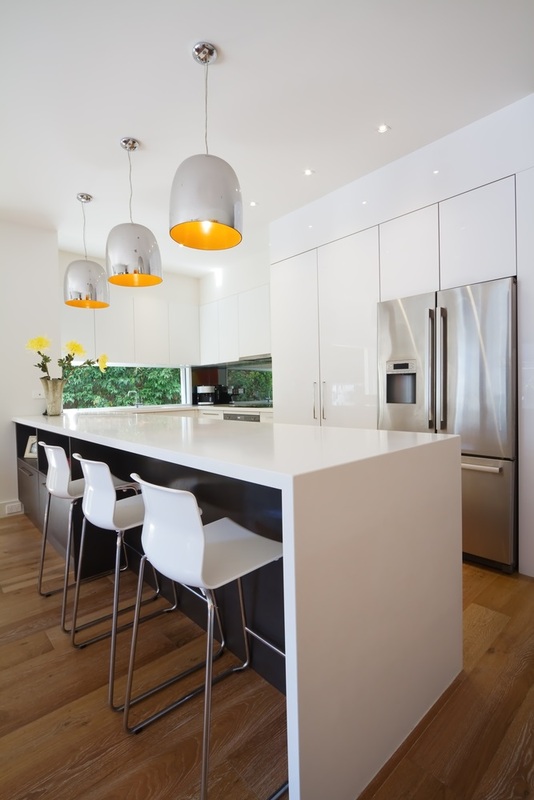 The designers used slab cabinet fronts to achieve a clean and modern look. 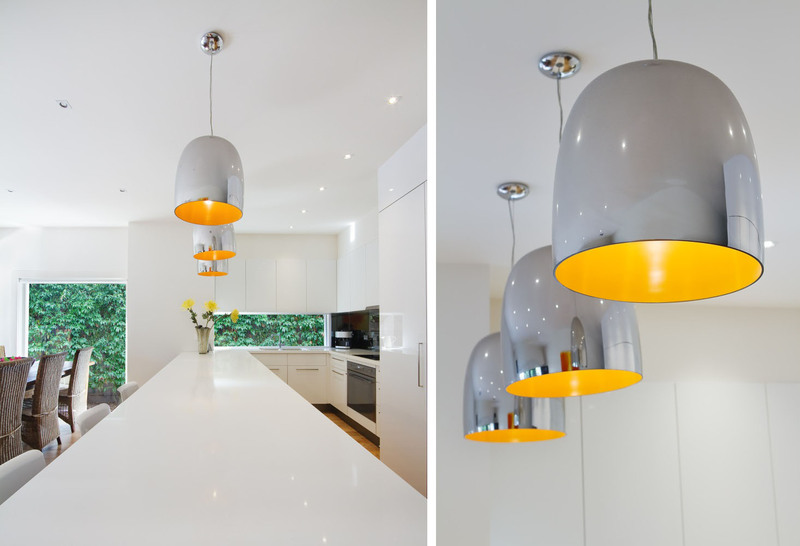 To add warmth to this kitchen, the designers hung three modern LED pendant lights above the island. The light fixtures are made from chrome and have warm white LED light bulbs inside. The light it emits is warmer, which tames the bright white benchtop under it. It balances the lighting in the kitchen. Tell us in the comment section below, or talk to one of our Melbourne Architects.